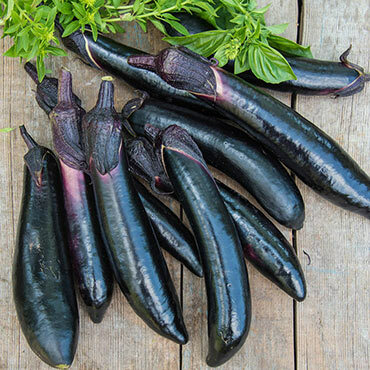 In Japanese, "Shikou" means "supreme" so it's fitting that this eggplant is named Shikou Hybrid. Glossy, dark purple skin and a purple stem make this fruit a stunning addition to the edible landscape. Eggplants are 6-8 inches long and about 1 ½ inches wide with white flesh and very few seeds. It has thin, tender skin which requires no peeling, so meal prep is quick and easy—just slice and enjoy grilled, sautéed or added to your favorite stir-fry. 70-80 days to maturity.